MR Dileep | I.K International Publishing House Pvt. 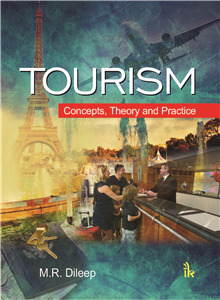 Ltd.
is a prominent academician, author and columnist on tourism. Having qualifications including M.T.A, MPhil, PhD and IATA Diplomas (Air Transport and Cargo); his work experience includes; faculty, major head and system wide coordinator with the Ministry of Higher Education (CAS Salalah), Sultanate of Oman; HoD of Tourism at Kerala Institute of Tourism and Travel Studies (KITTS); and senior lecturer at Pazhassi Raja College (Calicut University), Pulpally, Kerala. Dr Dileep is a recipient of 'Indira Gandhi Gold Award' of GEPRA and an expert contributor in the ';Encyclopedia of Tourism' (Springer, New York). Among the four, two of his books, Information Systems in Tourism and New Age Tourism-Neo-Colonial Impulses (in Malayalam), are widely used, and some of his papers have been published in reputed journals including Tourism Recreation Research and APJTR.